I have had fellow bloggers ask me how I get traffic to my blog. While there are many different ways I get traffic to my blog, I have already shared a couple ways to do so, in previous posts. 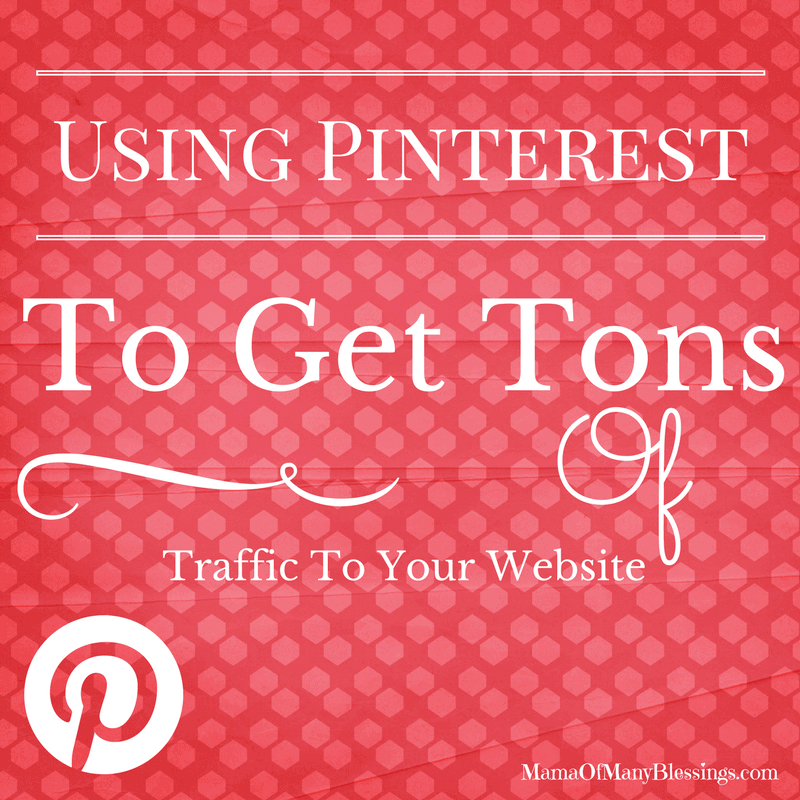 Today I am going to share how to use Pinterest to increase blog traffic. Pinterest is my biggest social media traffic source so here is a look into how I use it! Anyone who has been following me for a while knows that I have a slight Pinterest addiction. There are not many social media sites that I can commit to very well. Pinterest, however, has been one that I have been able to stick with and really just love. Set up your own Pinterest account. 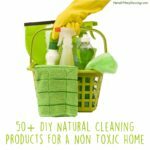 There are many ways I use Pinterest around our house, homeschool, kitchen, and more. It is such a fun social media platform. 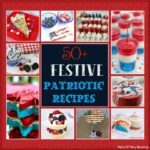 Now I will admit that not all the pins I have pinned will I ever use, but there are plenty I have used or gotten really great tips and ideas from. Setting up your Pinterest account is a rather simple thing to do. It’s pretty much the same as setting up any other account. First, head over to the website which is HERE. One you are on the website, either sign up through Facebook or enter your email address and type in your password. You probably will have to confirm your email address, but I’m not 100% sure. It’s been a long time since I’ve made my account. Once you have made your account make a couple different boards about things that interest you. Find some people to follow to fill your feed with interesting things to pin to your boards. What they pin will show up in your “Pinterest feed”. If you don’t have ideas on people or boards to follow, just go up to the search bar at the top of the Pinterest page. Type in a topic that you would be interested in pinning, and click on boards instead of pins. You will pull up different boards that are about he topic you are interested in. For my own personal use. To help draw traffic to my website. My primary reason for using Pinterest is because I love being able to have all of my ideas in one easy spot. 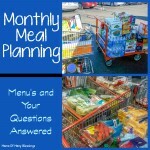 If I am looking for new recipe ideas for our big meal making day, I would head over to my Freezer Meals Pinterest board and look there for ideas. 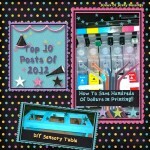 If I am looking for some new arts/crafts ideas to do with the kids I would head over to my Arts/Crafts Pinterest board. Lastly if I wanted some indoor fun ideas for the kids to do I could head over to my Rainy Day Activities board for a HUGE list of ideas to do. This saves me the time from having to look up ideas and find what might be useful to me at the moment. It also makes things easier if I am putting together a unit study for my kids in our homeschool. Since there are plenty of other people out there that have similar interests as you those people are likely to follow you and repin pins they like of yours. Pinterest has been my #1 social media traffic drawer for years now. If you have great ideas on your website people are going to want to pin your posts to view later or to share with their followers. 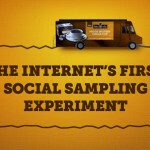 This will help continually draw traffic to your posts long after the post has gone up. In order to get people to want to repin your posts you need to do 2 different things. Have a pin it button ~ on your blog so people can easily pin your posts. People need a quick way to repin your posts, if they don’t have it they will not want to pin your posts. 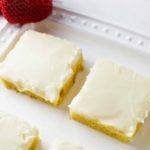 Make Pinable images ~ When first starting blogging you don’t realize how many more pins you can get on your posts if you just have more “pinable images”. Yes just regular photos are great to have in your posts. Making a pinable images is very important to making your images get repined on Pinterest. As time goes on I am even working to make pinable images on my old posts to make them more Pinterest friendly. If you don’t have great photos to use to make pinable images, try using free stock images with good text and that will work great. I have quite a few Pinterest boards some are general topics, others are more specific. I also have hidden boards I use in a couple ways! They say that having around 100 public boards is the best. It took me a couple years to get this many boards since I never thought I would have that many ideas for boards. An example of how I organize my public boards is this. If there is a topic that we will be learning about in our classroom I would search for that term. For example we will be researching Australia soon so I would look for pins with things that we might be interested in doing while learning that. All the things I find we might want to do I would pin into my Australia Pinterest board. Now I don’t make boards for every single topic or I would have a TON of boards. I do have a board for all of the continents but I also have a geography board for interesting things that wouldn’t fit those topics. I also have a general Homeschool board to pin all other homeschool ideas that wouldn’t fit into a specific board. 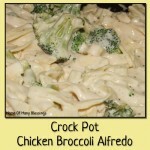 Someone who blogs primarily about recipes might have boards for appetizers, main dishes, crock pot meals, snacks, etc. What topics you blog about or your interests are really what you want to set your boards up with. There are a couple different ways that I use hidden boards. First off if there is a topic that I am looking to blog about I might pin some examples onto a hidden boards to refer to later when I am making that post. I also have hidden boards that can be used by Board Booster to pin from daily. I go on a couple times a month and put new pins into these secret boards so that they can be pinned at optimal times by the program. When I first started on Pinterest I was very slowly but steadily receiving new followers. Since March I have gone from 7,800 to 50,000 followers. I have done this by using a few programs that are so helpful for gaining new followers!! New followers equals out to more exposure for your blog posts, which then means more traffic to your blog. I will be sharing in the next couple weeks step by step just how I have done this. Follow us by email if you want to receive an update on when that post goes live! What tricks, tips, and ideas have you learned from using Pinterest? How has it been useful in your home, or homeschool? Leave a comment below letting me know, I would love to hear from you!! Looking for more blogging tips I have share previously? Check out the links below! 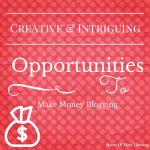 Creative and Intriguing Ideas To Make Money Blogging. 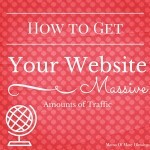 How To Get Massive Amounts Of Traffic To Your Website. 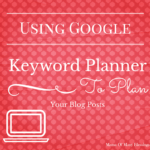 Using Google Adwords Planner To Plan Your Posts. I may be linked up with THESE great liny parties. I didn’t know you wrote about blogging! Me too! My Pinterest traffic is disappointing. I have a friend who is a Pinterest coach, so I follow her advice she gives me for free. My referral traffic is still next to nothing. I know how to get traffic from Pinterest; I’ve written articles about it. Still disappointing stats. It is something I only occasionally write about. But with how much my viewers enjoy it I should write about it more often!! It can be such a tricky thing to get going, but once the traffic starts coming in from it the stats generally keep improving. The next post in the series might give you a little more help to boost your incoming traffic as I share the tools I use to really help boost my followers and hence improve the click through rate to my blog. Thanks for stopping by and commenting! I hope you have a blessed week! !